Black Magic Six were founded by former members of metal band Disgrace and noise rockers Sweetheart in 2006. The two guys from Helsinki have changed radically their musical orientation with their new band, playing now dirty and smelly retro rock as we are normally used from The Cramps and The Jon Spencer Blues Explosion. J-Tan is in charge of the guitar and the vocals, Lew Siffer exclusively plays all the percussive instruments. A couple of guest musicians add vocals, keyboards and trombone on some tracks, but you won’t hear a bass guitar on the album. This doesn’t really matter because the songs are all kept quite simple. The CD was already recorded in 2007, but took more than two years to find its way out of Finland. The album title has voodoo written all over it, and accordingly the music sounds just as creepy. The musicians use tried and tested recipes, but are still able to offer diverting entertainment. On some tracks they rock with an unrelenting attitude that recalls the Stooges, while other ones are more decent and groovy. They only get out of line with the bluesy Last Nite and the brit-poppy True Essence Of Love with parallels to the Kinks, possibly the best moment on the album. 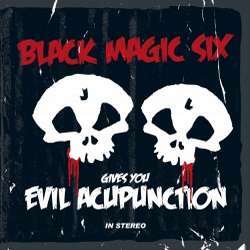 If you like Sixties and Seventies styled rock’n’roll, you should have a good time with Evil Acupunction. I am not the biggest fan of the genre, but didn’t mind spending a short half hour with the duo. I would appreciate though if they added a more original touch to their music in the future.